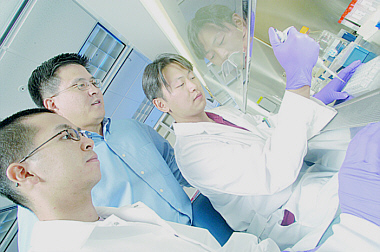 In his Maryland Hall lab, Michael Seungju Yu, center, assistant professor of materials science and engineering, produces modified collagen with doctoral students Xiao Mo and Allen Y. Wang. Collagen often pops up in beauty products and supermodels' lips. But by mating collagen with a molecular hitchhiker, materials scientists at Johns Hopkins hope to create some important medical advances. The researchers have found a simple new way to modify collagen, paving the way for better infection-fighting bandages and a treatment to block the formation of unwanted scar tissue. In addition, tissue engineers may be able to use modified collagen in the lab to help control the formation of tiny new blood vessels that can be used to promote the integration of tissue implants in patients. Michael Seungju Yu, an assistant professor in the Whiting School of Engineering, described the new collagen modification process and its potential medical uses in an Aug. 30 presentation in Washington, D.C., at the 230th annual meeting of the American Chemical Society. His team also published a paper on the work earlier this year in the Journal of the American Chemical Society. The research focuses on the human body's most common protein. Collagen promotes blood clotting and provides the spongelike scaffold upon which cells build nerves, bones and skin. Because it is nontoxic, dissolves naturally over time and rarely triggers rejection, collagen is commonly used in cosmetics, drug delivery systems and biocompatible coatings. Yu's goal is to change some of collagen's biochemical or mechanical properties to give it new medical applications. Traditionally, scientists have altered collagen by using intense heat or chemical reactions, techniques that may damage the protein or limit its safe use in humans. Yu's method, however, requires only physical mixing of collagen with even smaller molecules called collagen mimetic peptides. "That's the beauty of this," Yu said. "If you want to attach these molecules to collagen, you don't have to cook it or use harsh chemicals. You just mix them together in a solution." In lab experiments, Yu and his colleagues have shown that this kind of molecular marriage does take place. They attached fluorescent tags to the peptides and observed the glow in collagen that had been mixed with the smaller molecules. Exactly how and why the collagen and the peptides join is uncertain. But researchers know that collagen molecules form a distinctive triple helix in which three long protein strands intertwine like rope. Yu speculates that because the smaller collagen mimetic peptides have a propensity to make similar triple-helix structures, they are naturally attracted to collagen molecules. He believes the peptides make themselves at home within gaps formed by loose collagen strands. This linkup opens the door to new medical treatments, Yu said, because it is easy to attach bioactive agents to the peptides. When the peptides bind with collagen, these attached agents can dramatically change the way collagen behaves in the body. For example, collagen normally attracts cells to close up a wound and form scar tissue. But this property is not always desirable; a clot can be dangerous inside a blood vessel or at certain injury sites, where scar tissue can interfere with the formation of new nerve connections. Modified collagen can follow a different course. In their recent journal paper, Yu and his colleagues reported that they had attached a chemical, polyethylene glycol, to the peptides, causing collagen to repel cells instead of attracting them. When the researchers added human cells to a lab dish, the cells migrated toward an untreated collagen film but avoided the modified collagen sample. This form of collagen could stop the formation of blood clots and scar tissue, and scientists may be able to use it to control the shape and organization of cells and tissue that are grown in a lab, Yu said. "With this process," Yu said, "we can make the collagen that's already found in the human body behave in new ways, including some ways that are not found in nature. Modified collagen can give us a great new tool for treating injuries and illnesses." Yu's collaborators on the Journal of the American Chemical Society paper were doctoral students Allen Y. Wang and Xiao Mo and former Biomedical Engineering faculty member Christopher S. Chen, who is now affiliated with the University of Pennsylvania. Yu's research is supported by grants from the National Science Foundation and the National Institutes of Health.